Booking Details: Tickets: £15 at the door or pre-book on 01243 378900. No charge for University of Chichester Music students and staff. A concert by the Ensemble Reza string sextet. 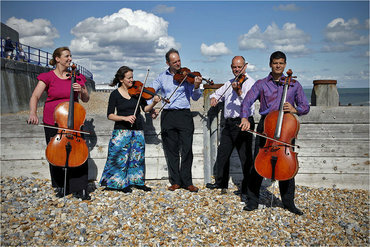 Established in 2013, Ensemble Reza was formed so that players could enjoy performing chamber music closer to home, taking first-class music to audiences in Sussex and across the South East. The combination of virtuoso musicians who are close friends performing together results in breathtaking performances. The Ensemble will play Dvorak’s exuberant Sextet in A major and Schoenberg’s wonderful late romantic work, Verklarte Nacht. Please note that the concert will take place in the Cloisters rather that the Chapel. The Cloisters is just a few minutes walk from the Chapel on the main campus.